By Keith Cowing on September 29, 2015 11:04 PM. 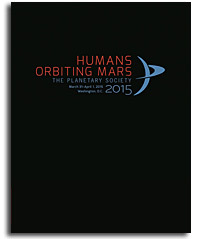 Keith's note: The result of the closed door Humans Orbiting Mars report has been released. According to this report missions to Mars only orbit the planet by 2033. Crews would control robots on the surface. If there's enough money then the report suggests a landing in 2039 but they'd only stay on the surface for 24 days. Long duration missions on the surface of Mars would not start until 2043 a decade after NASA's current (but unfunded) plans. All of the missions in this report require hardware that has not been designed or budgeted for (just like NASA). NASA will be required to walk away from ISS in 2024 so as to free up money for Mars - and the report assumes that human spaceflight budgets will be flat with growth for inflation for several decades. This plan puts humans on Mars a quarter of a century away. NASA is already challenged to mount a program that takes 20 years - Planetary Society wants to stretch that even further - indeed, in their plan serious surface expeditions would have to wait nearly 30 years. Of course there's always the magic unicorn of foreign partners, commercial donations, or other sources of money (not spelled out) which might pop up and make things happen earlier - or maybe not. Oh yes: this plan makes no mention of the two year slip in launching the first crewed Orion mission which should push everything to the right by a year or two. In summary the Planetary Society has taken NASA's various plans, thrown them up in the air, rearranged the pieces and tried to do things on the cheap. The net result is an unrealistic delay in getting humans to the surface based on hardware that is not even budgeted for by NASA. I am trying to picture how Congress is going to fund a program for 20 years that almost puts humans on Mars. Yesterday the Planetary Society posted an article on the Mars water news which included this gem: "This is one of many reasons I'm glad that The Planetary Society is advocating an orbit-first approach to human exploration. If we keep our filthy meatbag bodies in space and tele-operate sterile robots on the surface, we'll avoid irreversible contamination of Mars -- and obfuscation of the answer to the question of whether we're alone in the solar system -- for a little while longer. Maybe just long enough for robots to taste Martian water or discover Martian life." It is quite obvious that the Planetary Society would be quite happy if it took longer to put humans on Mars than NASA and others would like it to take since "Filthy meatbag bodies" don't belong on Mars - if at all possible. "Critics, including NASA Watch's Keith Cowing, say the Planetary Society's "orbit-first" blueprint is too timid and relies on hardware that NASA has not yet budgeted for. "I am trying to picture how Congress is going to fund a program for 20 years that almost puts humans on Mars," Cowing wrote on Tuesday. [Planetary Society's Casey] Dreier, however, was doubtful that a more accelerated schedule would draw enough political support. "It'd be great if we could do it in 10 years," he said. "But that will take a lot of money over not a lot of years, and I don't see any pathway to making that happen." This page contains a single entry by Keith Cowing published on September 29, 2015 11:04 PM. In Space No One Can Hear Space Advocates Scream was the previous entry in this blog. James McLane is the next entry in this blog.